To celebrate 55 years of the Original Whopper Sandwich, participating Burger King are offering a bogo on their Whopper sandwiches. 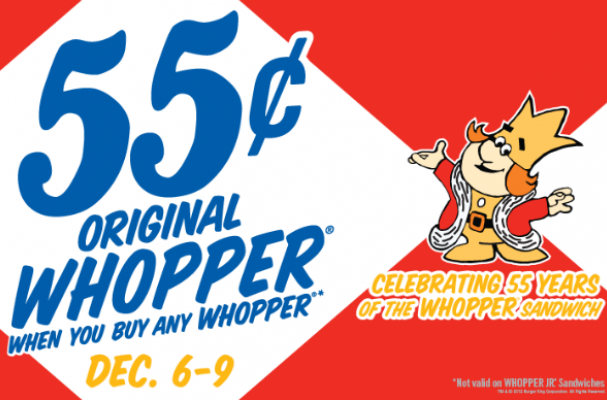 From December 6th to 9th, purchase any Whopper and get a second for a mere 55 cents. And if the Whopper bogo, a quarter pound of fire-grilled beef topped with tomatoes, lettuce, creamy mayonnaise, sliced pickles, and white onions aren't enough to entice you, then maybe Burger King's Cheesy Burger will.